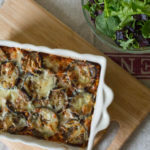 There have been several aubergine themed recipes on the meal plan and blog recently, I just can’t seem to eat enough of them! The combination of aubergine and tomatoes is a hard one to beat, it’s one of my absolute favourites. Even better when the veggies are roasted to intensify the flavour and served with cheese. My roasted aubergine and tomato pasta is the culmination of many attempts to get it just right. Dicing the aubergine up like this not only means a quicker cooking time but more aubergine surface area to soak up all that olive oil. Tip the diced aubergine, tomatoes and garlic onto a non-stick baking tray. Add a good glug of olive oil along with some salt and pepper and mix everything together with your hands so that everything is well coated in oil and seasoning. Roast everything in an oven at 190C for 25-30 minutes or until the tomatoes are just starting to split and the aubergine is turning golden brown. While the aubergine is roasting cook the pasta according to packet instructions. Drain the pasta well and tip in the roasted veg (discarding the garlic) along with the sundried tomatoes, basil and mozzarella. 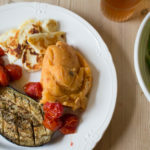 The hot pasta will start to melt the mozzarella which in turn will get all tangled with any caramelised bits of tomato or aubergine that you scraped off the tray. The silky aubergine, sweet tomato, creamy mozzarella, fresh basil and intense sundried tomato are such fantastic flavours together. I am yet to try batch cooking this and freezing it and I think without the cheese it would freeze quite well. You can serve it over pasta or use it as a bruschetta topping; I would be the last person to judge you if you just ate it on its own. Another version with ricotta will be experimented with soon too. Any excuse for more aubergines in my kitchen. Roasting is the best method to make veggies. This is a simple yet very tasty weekday meal. Mmm, eggplant. You’re right — it combines so well with tomatoes. Perfect taste of summer! This is definetly my kind of meal, wow those favours must be amazing. We love this – such fresh and comforting flavors! I love this recipe – it has everything I like – roasted sweet veggies, pasta, cheese, and is so simple! Thanks for another winner! This pasta looks delicious. I like to roast veggies too. 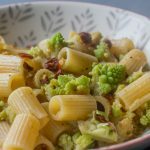 This is a light and tasty dish! delicious! roasted tomatoes are a thing of beauty and must add such a delicious flavor to your pasta! can’t discount the eggplant either!